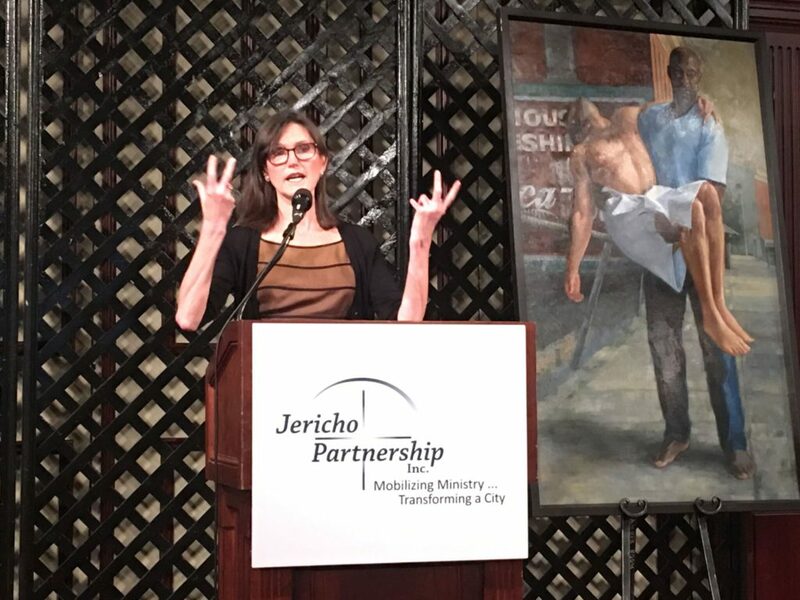 Hundreds woke up to an inspirational morning of faith, love, compassion and a call for action as they gathered at the Amber Room Colonnade on July 14, to partake in the Jericho Partnership’s Faith in the Marketplace breakfast. Number 1 – Excellent education: 100 percent of Jericho kids graduating from high school, career ready and mentored to be men and women of honor. Outcome number 2 – Free pediatric services, free healthcare provided by Jericho’s Samaritan Health Center for over 2,000 uninsured youth per year, mostly from minority families, in the city of Danbury. Number 3 – Sanctity of life: dignity for life at all stages, not only at conception but also in our final days here on this Earth. More than 300 lives have been saved by Jericho’s Hopeline Pregnancy Resource Center each year. Outcome number 4 – Restore lives. Homeless men and women transformed for the love of Jesus Christ, to be independent and productive human beings by Jericho’s Good Samaritan mission and its new project with the city of Danbury, Clean Start. And finally, number 5 – Neighborhood transformation. Safe and caring street communities in partnership with residents, public schools, the city and the Spring Street City Serve ministry. Jericho accepts no city, state or federal government support, but it relies upon a generous and compassionate community for its financial funding, and also on the work of over 3,000 volunteers. Catherine Wood, the Founder of ARK Investment Management, was the keynote speaker who shone a light on keeping faith when facing great challenges in life, mentioning the message of encouragement in Psalm 91 to face our battles, which in her case, occurred during the 2006 financial meltdown. Six years later, August of 2012, Wood, was “hit with the Holy Spirit,” as she put it, over her head with a business idea, creating ARK in 2014. “I believe that God is at work here in Danbury,” said Wood. “In terms of the future, investing in the future, I really believe that is what Jericho Partnership is all about. Jericho is doing what those of us in the financial world, who are moving away from ‘safety’ or, in my case, savings, and reaching out, changing lives, changing the way the world works and making it a better place, said Wood. Jericho Partnership is a collaboration of word and deed ministry organizations and congregations dedicated to serving the at-risk community of Danbury, focusing on issues related to life and health, our youth, our homeless and needy and neighborhood transformation. For more information on how to help Jericho Partnership, Inc. continue its mission to mobilize ministry and transform a city, visit http://jerichopartnership.org.